Have a long weekend in Buenos Aires and want to hit the highlights—steak, tango, and Evita among them? Here are the classics plus a few surprises—like a lagoon-side run, a polo lesson, and a puerta cerrada closed-door restaurant. Viva Argentina. Run at Costanera Sur Ecological Reserve. If you’re an active type, get moving on your first morning—you’ll be up too late and eat too much later. Run, walk, or ride along the dirt trails of the Costanera Sur preserve (Av. Costanera Tristan Achaval Rodríguez 1550). Once a dump site, the reserve is now a mid-city wetland, with chirping birds and paths winding around three lagoons. Wander the cemetery. See where Evita and other Argentine luminaries lie at rest. I would say “buried,” but they’re actually contained above ground in 6,400 fascinating mausoleums. 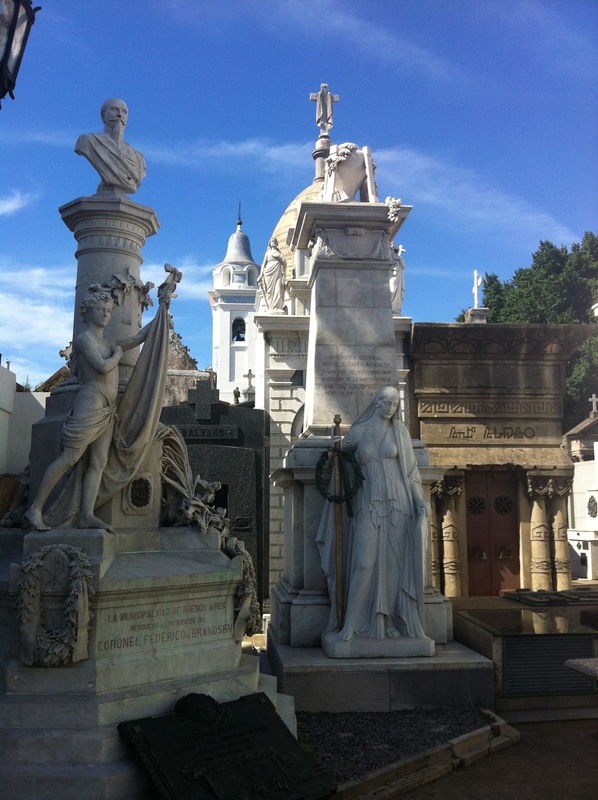 The grand Recoleta Cemetery (Azcuénaga) reminded me of its counterparts in New Orleans—irresistibly photogenic, jammed with history, and a must-see. Tour the National Museum of Decorative Art. Near Recoleta Cemetery is a dazzling old mansion that’s been turned into a gallery of fine art. The Museo Nacional de Arte Decorativo (Av.del Libertador 1902) holds everything from porcelain to weapons to El Greco paintings in gracious surroundings. The carriage house is a great espresso spot, too. When Buenos Aires got hot, we found an iced latte the best way to fend off an afternoon siesta. Take a polo lesson. If you can ride horseback, trying one of Argentina’s most popular sports is unforgettable. Marion, a German woman who married her Argentine tango instructor, now runs Polo Break. She’ll drive you to her polo grounds and set you up with a Spanish coach. Polo horses are trained for speed, so even if you don’t love striking a heavy ball with a long stick, you can take some thrilling gallops. Gorge on steak. A parrilla feast of grilled meat is mandatory in Buenos Aires. La Brigada (Estados Unidos 465) is a delicious, atmospheric place to have it. We went so far as to try bull testicles and lamb kidneys. But there are classic, perfectly cooked steaks, too. The walls are packed with Argentine sports memorabilia to complete the man’s man feel. Take in tango. The truest tango is spontaneous, not choreographed. With that said, Tango Porteño (Cerrito 570) offers a glittery sampler of this national dance from its Italian immigrant beginnings to its fame today. The effect is a showstopper, and a seductive way to appreciate tango even if you don’t take a lesson. Browse the San Telmo market. This famous Sunday morning flea market peddles a mix of antiques and handmade goods around a central square and along cobblestone streets. We picked up a necklace of rhodochrosite, Argentina’s rose-pink national stone, among other finds. Prices at this fería are highly negotiable. Get the story at Museo Evita. 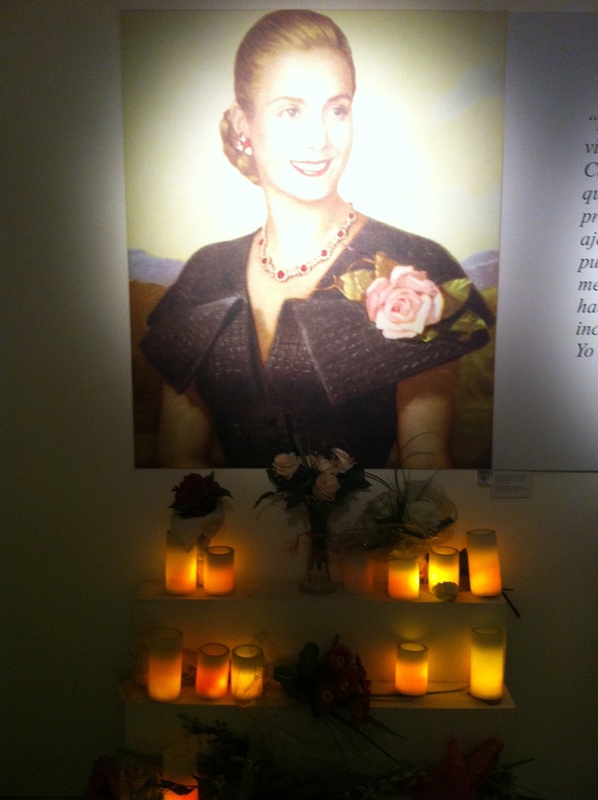 It’s hardly an unbiased presentation, but you can read through and between the lines at Museo Evita (Lafinur 2988) to better understand Eva Perón. The museum covers her early life and jump to stardom as well as her general-dictator husband and their joint political work. Eat a puerta cerrada meal. Buenos Aires has a unique array of closed-door restaurants in private homes. We chose the social Casa SaltShaker (Pte. J.E. Uriburu 1555). Chef Dan Perlman served us duck ceviche and caramelized eggplant, among other creations. Puertas cerradas are a great way to meet people, too. We clicked with a fellow American couple, David Hackett and Kathy PourSanae, and went on for drinks from there.